– Training & assessments: Induction, product, soft skills or other customer training – replace/supplement face-to-face efforts. 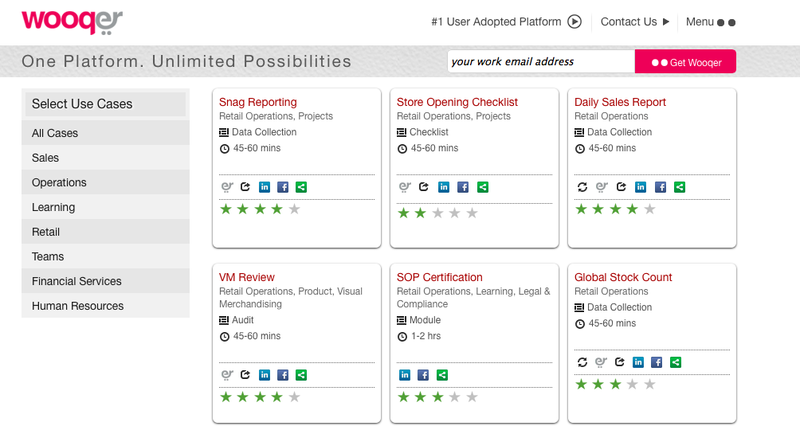 – HO & Branch Operations: Operational activities like SOP into checklists with tasks & workflows that are track-able, real-time. – Mobile Reporting: Supporting field teams operating out of office (e.g., sales) to report/order in real-time, from mobile devices. – Knowledge Management: Enterprise knowledge store with right information, accessible by right stakeholders as needed. DIY method allows you to do business understand/enabling processes without taking recourse on IT personnel […] works very well if you want to add value to business.” from Rakesh Pandey Ex-President, Raymond Shop, a Wooqer Customer, they have delivered on it. This is not to say their journey so far was easy, or slam-dunk. In this fast-paced business world, even SMB owners are moving away from Do-it-for-me model to keep up, and that is definitely the case in large companies. CIOs just provide infrastructure and get out of the businesses’ way. Such trends bode well for platforms like Wooqer, as they provide flexibility for “continuous” business process deployments. Wooqer like solutions are very much a need of the day as organizations nowadays bank on resulting employee productivity improvements. Wooqer Customers & Why adoption matters? It is definitely important for any company to have paying customers for various reasons beyond financial. It is equally important for early-stage product companies, to stay focused on adoption (by customers and users if they are different). This is because monetization/revenue does not equate to adoption by satisfied customer who continues to use the product long after purchase and it is function of the business model and pricing strategy (eg freemium). Adoption, on the other hand, is always an opportunity to monetize and is purely a function of product value. Thus using appropriate (read as non-vanity) metric – such as Wooqer’s “#1 adoption platform”– is important internally and for marketing communication, as it calls out how a business keeps its scores. Interestingly in Wooqer’s case, this focus on successful customer adoption has not only helped them to pivot better but also improve the value they are bringing to customers from what I gather. Any venture – be it an India-first company going after newer high-growth sectors in India (e.g. ecommerce, retail) or Global company coming out of India – after all has to have a metric that is nothing but a measure of the impact it creates in the market place. The Need – What is the pain being addressed? Take Brand or Marketing Managers for instance. It is not uncommon they are asked to measure the effectiveness of post-launch product GTM activities and spend along each milestone of this journey below. When Wooqer started in 2009, initial focus was to help Brand Managers to be more efficient in creating right content. Once they set out to address their pain point, market gave them the insight into other areas of this post-launch GTM activities journey that are far more fundamental and timely. By staying focused on adoption, I’d opine, founders pivoted their attention there. In early part of this decade in India’s high-growth sectors (e.g. ecommerce, retail), one of the major problems was the lack of consistency that came from rapid growth. Take retailer Aditya Birla group Madura F&L. With the rapid evolution and expansion of the Indian retail environment they were rolling outlets at a fast pace, as their ability to morph in response to market demands and consumer needs is nonnegotiable. Wooqer focused on these consistency issues. Engaging and managing their workforce is highly important as success within the retail industry is directly correlated to supporting a consistent brand image and providing superior customer experience. Retail Stores staff count is between 2-4 in small stores to 13-15 in bigger ones, and they have high-school level education. With broadly distributed locations and employee base, it is crucial that consistent standard operating procedures be established and implemented to facilitate their ambitious expansion plans. Marketing and managing many hundreds or thousands of retail products is difficult as is, but once inconsistencies start creeping in around employee knowledge about business workflow and processes, it causes productivity loss. Wooqer’s solution to such class of problems that demand improved employee productivity, is synthesized into this platform comprised of tools that enables integrated, two-way, real-time and measurable content exchange channel between the employee producers and consumers of content in a large corporate setting. It is deployed as a multi-tenant, tenant-isolated, elastic cloud-based SaaS offering (a delivery model but not SaaS as a sales model i.e., direct sales, not self-service). It enables each of the Wooqer’s clients to exchange & track the content between any of their business producer and content consumers using a simple 4-step methodology as shown in the adjacent picture. So what are the key insights that Wooqer had? Ones that told them that they can solve an enterprise pain point such as employee productivity with a software application? I would contend the following ones they had uncovered during their systematic search may have something to do with it as these ideas underpin the Wooqer platform. Organizations and teams can explore productivity improvement opportunities through automation where none existed before by equipping their employees with tools, scripted processes & workflows. Wooqer achieves operational effectiveness while enabling flexibility and real time collaboration by reorienting Information, Communication and Collaboration. Modeling how organization groups communicate across distance say between Head Office or Corporate and field offices to support consistency and innovation is a key insight. Wooqer supports various type of content (files, processes) and gets feedback in a fastest manner thru modular building blocks, which is packaged as checklist, audit, appraisal, data collection, assessments (see picture for sample list). Product collateral like Wooqer compass is also used to mentor, message, monitor and measure the process scripting that users do in the platform. Information technologies enable key divisions of an organization such as HR, Training, Operations, and Legal, to achieve operational efficiency. In addition, “socially” engaging ecosystem of stakeholders like employees, suppliers, and customers are some of the ways IT partners with business to enhance company’s strategic positioning. For this, the company’s back-end IT infrastructure (“Systems of Record”) must be linked up with the front-line (“Systems of Engagement”), so that information can flow smoothly, and important decisions can be taken in real-time. Wooqer being such platform of engagement, it facilitates user communities to function independently. Supporting business groups that tackle a variety of problems, without requiring them to see scarce IT personnel assistance is a big plus. One of the pitfalls many application development projects fall into is the failure to take into account the technology changes and the value of the user experience. Needless to say mobile app is very different from a traditional or web app design for the desktop or laptop. Consequently, one needs to take a very different approach for UX and interaction design across these platforms. To participate in today’s digital economy trends having a platform API is must. Ability to build modular capabilities with lightweight interfaces that don’t require heavy integration are key to connect with business services. Having recently completed Wooqer mobile launch (see above), these important aspects of technology and UX is evidently established well with the team. Thoughtfully engineering and UX for its target user base has unearthed some contra thinking which comes from deep customer empathy. For instance, staff attrition in retail sector is high (130%) so a single-click handover of work to another employee demonstrates this empathy. Retails users are also not highly educated so Wooqer UX in some areas “deviated” intentionally from standards initially, to enable these users overcome brittleness fear that was felt with slick interfaces shown in prototypes. Even in mobile, they have leveraged both the ergonomics and capabilities of the device and married it well to the existing back-end services to offer a full feature rollout. It is worth calling out that Wooqer is built as a Private Internet that enables any user ‘to be more’ by creating solutions to their work challenges on their own without sms, email, or phone calls in the shortest possible time by structuring work and measuring results. Prashant A Bhonsle, President at Wooqer adds their adoption drive goes well beyond enterprise users into SME as “Wooqer can not only give cost efficiencies to startups but also help build a culture of collaboration & quick response to market changes because of seamless data & information flow across organization“. Platform has 5 core features and many add on but all comes as a part of the base subscription fee. Content consumers get access to all assigned content either via native apps in mobile devices (iOS and Android) or web-based interface in desktop that content producers have published typically from their desktop. The content can be in (m)any format(s) like video, documents, audio, flash, etc and all sizes are supported. Assigning is a simple process that “publishes” the content to a list of selected group business consumers. Fine-grain publisher control for publishing like collating them into chapters & modules, ability to verify detailed content understanding, get feedback & start private or social discussion are all built-in. Business users are tracked by the roles they play in the organization – though the platform personalizes to individuals who fill the role. The separation between role and individual is maintained at the platform level which help retain role context & knowledge thru people change. Business processes are launched with a workflow that is custom-built around the content at the time of publishing. Creating a process to gather data can be as simple as a survey or more involved to collect any kind of business data. Processes to map workflows in real-time exists including canned workflows like Approvals, Reviews, Complaint Management, Audits, Reports. Adding due dates, escalations, milestones, notifications, and conditions like parallel or sequential branching are supported along with maintaining records for posterity. Workflows can be created in a few minutes and kept current, by updating them in a few seconds. Support to create alerts, reminders & milestones to summarize business reports and download then into tools like Excel or archive them as per business/IT practices require, are built-out. All this enables Wooqer users (producers) to run their business on data. Getting reports as well as submitting or seeing them or asking any question getting response either periodically or one-time from users (consumers) are possible even when they are away from office. Other personalization and socialization features include spotlighting a personal document, real time talk and feedback (using SMS, with urgency indicator) in the context of a document or business social context. The product is evolving with the users and sector adoption without customer-specific customization and retaining the platform nature. For instance when the banking sector customers came onboard to use Wooqer, issues such as security, uptime and regulation related features were added that also benefitted the retail segment without additional cost or upgrade burden. As they foray into addition sectors (emerging, industrial) and geographies(US, UK), the team seems confident in their ability to sustain a vibrant roadmap with “dip-in, dip-out” product management focus to zoom in and out to see the big picture without loosing the details of a requirement or feature. Wooqer platform is primarily designed to drive communication & engagement and hence belongs in the business application market. It shares this space the likes of Microsoft with its Sharepoint product that was recently strengthened by the $1.2B Yammer acquisition. With social HR tech, IT and Customer Relationship Management (CRM) software as adjacent spaces, it is part of the broader circle. IDC analysis pegs this market worth for business social networking at $4.5B by 2016, a clear indication that there’s still a lot of open space in the social technology realm — especially in the employee productivity application market where Wooqer squarely sits. Customer and industry testimonials for Wooqer are very positive especially from the likes of Retail Association of India, in academic publications (IIMB case study that is currently a Harvard Business Case, SHRM paper on “Solving emerging HR challenges – The Wooqer Way”) as well as in commercial press. Impact they have created in their areas of focus is also worth noting. To quote a Wooqer customer from a press article : Wooqer is becoming a single point of contact with the entire network and for all operational activities. Training emerged as a large-use case as we found ourselves being able to achieve a lot more with the same set of resources. Wooqer has assisted in the democratization of ideas by making sharing of ideas and thoughts more free and open. It has also helped in seeking a majority opinion before implementing the key operational decisions. Hence Wooqer as a platform has been able to address many loopholes. It did take us some time to get started with the platform and discover our own ways of working. The discovery continues till date, as the organization continues to find new uses of the platform. Wooqer is a 5+ year old, bootstrapped product startup company with significant market traction. They pivoted early on with their India-first market learnings. They have established a strong foothold in Retail sector in India and foraying into other sectors like Banking/BFSI and industrial houses in India and abroad (US & UK). They see email and spreadsheet use and ad-hoc way of doing as the primary competition (Sharepoint & Salesforce to a lesser degree) to displace or be compared with. Annual Licensing on per-user/per-store basis with professional consulting for initial deployment is their monetization model. The Company took first two years to build the platform and it is in commercial operation for the past three years. Vishal Purohit, with his co-founder Pavitra Saxena, started Wooqer in 2008. Vishal was founder for GarageAgain Ventures and co-founder of CoreObjects (later acquired by Symphony Services) as well as everse/Velocient prior to bootstrapping Wooqer. His technology, sales, operations, chief-executive and advisory roles paved his path to Wooqer. Co-founder Pavitra Saxena started as an engineer in Cognizant and soon become senior architect there and later at CoreObjects. Pavitra is Wooqer #1 and together, they have over 40 years of technology & enterprise software experience. Currently, Wooqer team’s strength is about 40+ with a few outside Bangalore/ abroad. The team includes IIT/NIT and IIM grads, and is roughly 60% engineering/quality and the rest in sales and operations like customer advocacy. They have a unique video-based hiring process and are investing in skill-building. Though Wooqer currently caters to the banking or retail sectors, predominantly, the use cases described above can certainly be applicable to many verticals. Mobility is also changing everything. All business will have customers or employees undoubtedly facing business challenges that can and need to be addressed through a front-line “System of Engagement”, so that information can flow smoothly, and important decisions can be taken in real-time. Every industry all over the globe is looking to benefit from this increased employee productivity and efficiency, so their prospects look bright.